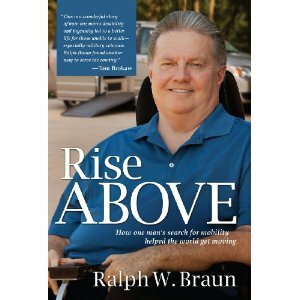 We recently had the opportunity to review the inspirational book Rise Above, by Ralph W. Braun. "On a hot summer day in 1947, I was told I would not live to see my 13th birthday ... Ralph Braun had two options: sit and wait for that prediction to come true or use those words as fuel to prove it wrong. He never gave a second thought to which path he would choose. The doctors who diagnosed Ralph with muscular dystrophy at the age of six and handed him his death sentence were wrong. Not only did he live to see his 13th birthday, but he founded BraunAbility, the world s leading manufacturer of mobility vehicles. It wasn't an easy road. When Ralph couldn't rely on his own two legs anymore and he d outgrown piggyback rides on his father s back, he began using a wheelchair. Life went on, and Ralph was determined to find a way to keep up with it. He wanted an education, a career, and a family, just like anyone else; he just had to work a little harder at it. First he invented a motorized scooter, the Tri-Wheeler, so he could conserve energy and keep his job as a quality control inspector at a nearby factory. When the factory moved a few miles from his home, he outfitted an old postal Jeep with hand controls and a hydraulic lift so he could have reliable transportation to and from work, no matter the weather. As his mobility increased, so did attention from the disabled community. Fifty years ago he was a young man in a wheelchair who needed to get to work. Today Ralph Braun is CEO of BraunAbility, the largest manufacturer of wheelchair accessible vehicles in the world. Capitalizing on the age-old saying Necessity is the mother of invention,Braun refused to let his disability hold him back and, in the process, brought independence and mobility to thousands. Rise Above tells the story of how self-reliance, common sense, and a refusal to accept the status quo led to one man s triumph in business and in life. Ralph quickly realized an underserved and underappreciated market existed, and he developed a wide range of mobility products to meet its needs. While Ralph Braun's story is a powerful example of true entrepreneurial spirit, this book is more than a successful business model. It is the story of America s evolving attitude toward the disabled community. It is the story of the powerful love of parents determined to give their son every opportunity and chance to succeed in life. It is the story of discovering the unlimited potential within each of us, regardless of what obstacles we may face. No matter who the reader, this book offers something for everyone. Ralph Braun's story is an inspiration to rise above any challenge." What we thought: Rise Above is truly an inspirational story. I guarantee many of your troubles will seem like nothing after you read Braun's moving story. When you finish this book, you will be left with the feeling that with determination you can overcome any challenge just as Braun did:) If you have a book lover on your gift list or just someone who could use a little inspiration, this book is definitely recommended:) ABCD Diaries gives Rise Above an A+! Buy It: Find this inspiring novel at your favorite book seller! superb article… but what can I say… I procrastinate a lot and don't manage to get nearly anything done.